Have you ever seen a predominately black JRT? 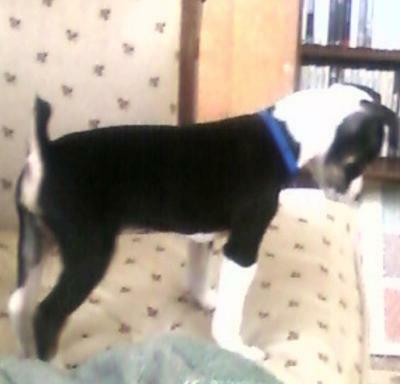 I know the breed standard says mostly white, but we found, and adopted, a mostly black JRT puppy. Our vet confirms perfect health and that he is probably full-blooded. 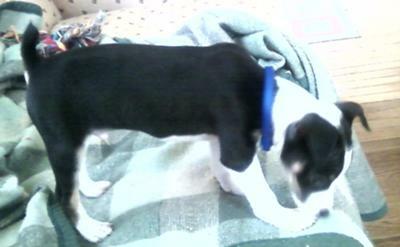 He was abandoned (basically set out in the trash) and we gave him a home with our 4 yr-old JRT female, who adopted him. The vet says about 3 1/2 months old. My JRT is exactly like your black one. Wherever yours is black mine is a tanned whiskey type color, even the white markings are in the same places. Mine is 8 weeks old, born on 1st January 2011. Pure breed from a long line. He is the most beautiful pup, I luv him. Yours is beautiful as well. These type of coat colours are not common and therefore real special. Take good care of him. I called mine 'WHISKEY'. Black, blue or purple you have a beautiful JRT there. I have seen all kinds, rough coat, smooth coat, broken coat, in every color possible(within the JRT color lines) and I can tell you that yours looks like a JRT. Thank you for rescuing that precious poochie too! Your 4 year old and you are very blessed to have this puppy. I also have a predominantly black JRT puppy too. I got her last sunday, and saw both her parents, neither , which had any black in them !!!!!! Who cares anyway?Your puppy is gorgeous! How gorgeous, I have never seen a black JRT.